Once again in 2012, the Porsche Carrera Cup GB runs alongside the MSA British Touring Car Championship at the most important and prestigious race meetings in Britain. The 10-weekend schedule features 20 races at all of the leading race circuits in Britain, including Brands Hatch, Silverstone, Oulton Park and Donington Park. In total, the 2012 championship prize fund is almost £160,000. The overall Driver Champion, the Pro-Am 1 Class Winner and the Manager of the winning Team in the Carrera Cup Great Britain 2012 will have the use of a Porsche 911 road car for one year, commencing from the day of the end of season awards evening. The Most Improved Driver Through the Year will win £1000. Many ambitious young drivers are now seeking to use the Carrera Cup GB to trace the steps of Richard Westbrook to the very top of sports and GT racing. Having won the Carrera Cup title, Westbrook went on to win the international Porsche Supercup twice in 2006 and 2007 and earn himself a place among the GT racing elite as a Porsche factory driver. The entry for the coming season has both quality and quantity with more potential race winners than ever before and once again the grid will be represented by the Carrera Cup GB Scholarship winners who won £80,000 towards their Carrera Cup season in the annual Scholarship programme. Racing Tyres : All tyres used in the Carrera Cup GB are provided by series partner Michelin. Each competitor is allowed to use two sets of slick racing tyres per race weekend, although the number of rain tyres is unlimited. Pre-heating and any type of chemical and mechanical treatment of the tyres is not allowed. Classification : In each race, drivers will score points on the following scale: 20-18-16-14-12-10-9-8-7-6-5-4-3-2-1 to the first 15 drivers in each race, with an additional point for pole position and a point for fastest lap in each race. 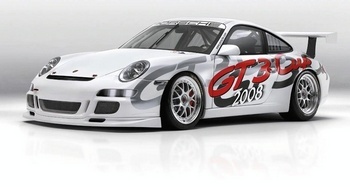 Once again in 2011, the Carrera Cup GB will continue to have a pro-am category for non-professional drivers. Trophies will be awarded to the drivers who finish in first, second and third place in each race in both the pro and pro-am categories. Pro-am drivers' points count towards both the pro and pro-am categories. Tim Bridgman won the 2009 Porsche Carrera Cup GB during the final two races of the season at Brands Hatch (3/4 October), taking a maximum weekend score of 44 points to jump ahead of James Sutton and Tim Harvey in the final standings. Bridgman claimed the title for Team Parker Racing with two poles, two wins and two fastest laps to beat 2007 champion Sutton and 2008 champion Harvey to the title. "Going into Brands we were eight points back, and we set ourselves the target of maximum points. We achieved that," said the 24-year old from Stansted. "All season the championship has been the target," said Bridgman. "Stuart Parker and I have been so focused on winning this and so much work has gone in from everyone in the team. To achieve your goal is a fantastic feeling. It's 50% happiness and 50% relief. This has been my dream!" Bridgman paid tribute to the level playing field offered by the Carrera Cup and said that he loves driving the 911GT3 Cup car. " I have to thank Porsche for keeping such equal equipment," he said. "I can honestly say this is by far the most equal of any one-make championship I've raced in. That makes a big difference." Already, Bridgman has the Porsche Supercup as his target for next season. "Supercup is where I want to be. I've made no secret of that aim this season and I want to be racing on the international stage next year," he said. "I believe I deserve a chance and I've got a lot to offer." Having finished runner-up in three of the previous four seasons, Tim Harvey is celebrating victory in the Porsche Carrera Cup GB after the final race of the season at Brands Hatch. Harvey, who has been racing for nearly a quarter of a century, achieved a major personal ambition by winning the title he has been chasing for five seasons. "I've been close to the title before and I haven't enjoyed my racing as much as this for years," said Tim. "The cars are great and the competition in the Carrera Cup is brilliant." He clinched the crown in the 20th and final race of the season by finishing ahead of title rival Michael Caine. "It's a feeling of relief, I suppose. But it wasn't until the last lap of the last race that I began to relax a bit." Over the second half of the season, Harvey chipped away at Caine's advantage and moved ahead during the penultimate weekend of the season at Silverstone. "The second half of the year has been very good for us and we've had the momentum. When I won the BTCC in 1992 I had the momentum in the second half of the year," said Harvey. "I just had a good feeling this year, but with all the things that have gone wrong in the past, I didn't think it would come off. It's the highlight of five years' work and enjoyment in the Carrera Cup and it's all come right this year. The depth of the quality in the championship has been better than ever before." Harvey paid tribute to the team and sponsors that made the result possible. "Full credit goes to Red Line Racing and everyone involved.I'd love to defend the title with number one on the car!" James Sutton hopes that winning the 2007 Porsche Carrera Cup GB title will help him graduate into the Porsche Supercup for 2008, following in the wheeltracks of former Carrera Cup champions Richard Westbrook and Damien Faulkner. Sutton clinched the title in a dramatic conclusion to the season at Thruxton over the weekend (13/14 October), when just six points covered the top three drivers after 20 races. Tim Harvey finished second and Steven Kane third in a superbly competitive season. "It's an amazing feeling; absolutely fantastic," said Sutton. "I've spent the last six weeks thinking 'what if', so I don't think it's really sunk in yet." Sutton secured his victory with third place in the final round, having started the race seventh on the grid. "That was probably the longest race of my life," he said. "I got into a position after five or six laps where I knew I could win, and then it just seemed to go on and on and on! The laps took so long to come down," he admitted. The 2006 season was the best yet for the Porsche Carrera Cup GB, with big grids, fabulous racing and big crowds to witness the debut season for the 997-model 911GT3 Cup car in Britain. What did not change was the name of the champion, as Damien Faulkner retained his title after another exemplary season for Team Parker Racing. Damien scored 19 podium finishes in 20 races, and was consistently quick. Only twice in two seasons with Team Parker Racing has Damien not finished on the podium. But he still had plenty of opposition and it was Danny Watts who won the most races for Team IRWIN with Red Line Racing. However, Danny missed four races early in the season when Richard Westbrook drove the car. When Porsche Supercup champion Westbrook elected to stand down from Carrera Cup GB and allow Watts to complete the season, the former F3 racer drove superbly and won 10 races in all. However, runner-up was Tim Harvey (Motorbase Performance), who was a constant threat to Faulkner and finished the season with a great win in the final round at Silverstone. The new pro-am category was a tremendous hit, with close racing, a host of different winners and dedicated podiums and prize money. Young Phil Quaife was a worthy champion for Motorbase Performance, winning the category in 10 of the 20 races and chasing the overall podium on several occasions. Nigel Rice (Red Line Racing) and Andy Purdie (RH Motorsport) led the chase of Quaife to take their share of the glory and end of season prize money. Finally, Team Parker Racing retained the teams' title thanks to the efforts of Faulkner and Jason Templeman in the SAS International backed cars.